Marilyn SanClemente March 16, 2015 March 17, 2015 Occasions catalog, Sale-a-bration, Stampin' Up! 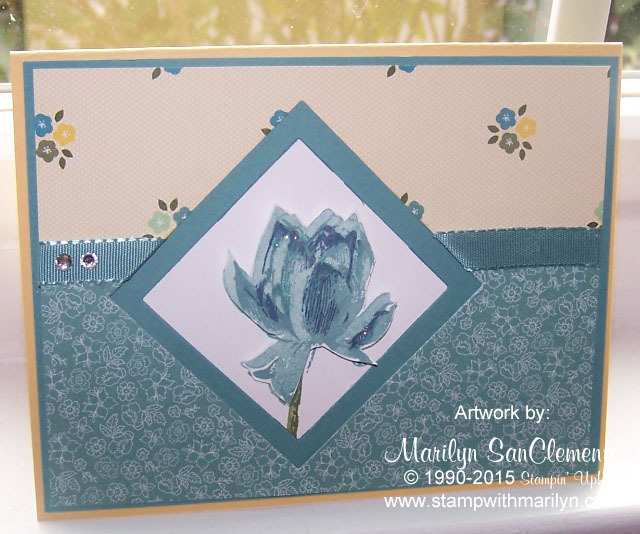 Today I have a card made with the Lotus Blossom Stamp set from the Stampin’ Up! Sale-a-bration catalog. This flower is beautiful! The card is inspired by today’s Mojo Monday sketch challenge. When I looked at this sketch, I envisioned the main element being framed by the card rather than as an image layered on top of the card. Cardstock: Lost Lagoon, So saffron, Whisper white and the All Abloom Designer paper stack. The Lotus Blossom stamp set is a 3 part stamp. So what does that mean? It means that you can use multiple colors to stamp the image – in this case the Lotus Blossom flower. That adds detail and depth to the flower that you just can’t get with a flower that is one color. So the trick with the Lotus Blossom stamp set is to line up the pieces of the stamp. Stampin’ Up! has added a tab to the top of the stamp image to help with alignment. First you want to start with the background shade which will be the lightest color. So I used Lost Lagoon ink and stamped off on a scrap of paper then stamped the image on a 3″ square of whisper white. That gives you a lighter shade. Then I stamped the second image of the 3 part stamp with Lost Lagoon ink (not stamped off) so that you have the full color. The third step of the stamp is stamped with Night of Navy ink which is a shade darker than the Lost Lagoon. Check out the video that I recorded to show how to stamp with the 3 part stamps HERE. It is hard to see with the card, but I stamped a second image and cut the image out. It is attached to the card with dimensionals and has a little dazzling details glitter glue added to the highlights of the flower to give it a little bling!